This is a late posting, but better late then never, I bought a Sabersmith Two Handed sword from owl and it was a very pleasant stress free experience. 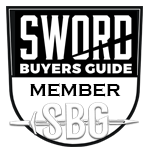 The sword was packaged well and it came to me exactly as advertised and in a timely manner! I would definetely do bussiness with him again!